THREE IDENTICAL STRANGERS, the astounding true story of triplets separated at birth, reunited through coincidence as adults, only to later learn a dark secret behind their separation, will premiere for television on Sunday, Jan. 27, in back-to-back, two-hour broadcasts at 9:00pm and 11:00pm Eastern (6:00pm and 8:00pm Pacific), CNN Films announced today. The film will be presented with limited commercial interruption. Directed by Tim Wardle and produced by Becky Read, THREE IDENTICAL STRANGERS took years to make at UK production house RAW. The filmmakers reveal the complex biographical story of David Kellman, Robert Shafran, and Edward Galland, seamlessly weaving interviews with the triplets and their families with archival footage, and using reenactments to bring key events to life. The filmmakers illuminate each extraordinary narrative twist and turn with interviews with journalists, researchers, and others. As Wardle and Read unravel the triplets’ family histories, they reveal the triplets were part of a controversial “Twin Study,” a mysterious psychological research project intended to investigate the central debate: is ‘nature’ or ‘nurture’ more central to human behavior? The film illustrates the impact of the study upon the triplets and their families, and upon other multiples involved, some of whom are yet to be discovered. “THREE IDENTICAL STRANGERS took five years of dogged investigative journalism, trust-building, and collaborative filmmaking to bring to the screen. After an incredible theatrical run, I’m thrilled the film is receiving its television premiere on CNN, the primary funder of the documentary, and a Network that shares the same values as the filmmaking team: truth-telling, and holding power to account,” said Wardle. As a preview to the broadcast premiere, CNN Films has also launched a companion podcast series via podcasting services: THREE IDENTICAL STRANGERS: The Science Behind the Story with Dr. Sanjay Gupta. Dr. Gupta, CNN’s chief medical correspondent and a practicing neurosurgeon, dissects a debate among many psychologists: whether people are shaped primarily by genetic or environmental factors. Dr. Gupta discusses these themes, as well as The Twin Study explored in the film, and reaction to the documentary, with special guests that include Dr. Nancy Segal, psychology professor and director of the Twins Studies Center at California State University at Fullerton; Dr. Barron Lerner, director of the bioethics curriculum at NYU Langone Health; journalist and author, Lawrence Wright (author of Twins: And What They Tell US About Who We Are, 1997); retired astronauts and twin brothers Cpt. Mark Kelly, USN (ret.) and Cpt. Scott Kelly (ret. ); THREE IDENTICAL STRANGERS filmmakers Wardle and Read; and CNN anchors, and parents of twins, Alisyn Camerota and John Berman.“Many people have tried to tell this incredible story. Tim’s years of research and dedication to finding the truth of this story reflects an extraordinary effort,” said Amy Entelis, executive vice president of talent and content development for CNN Worldwide. “We have been extremely proud to support Tim’s work, along with his colleagues at RAW and Channel Four, and are very pleased that we are finally able to present this remarkable film for our viewers,” Entelis said. THREE IDENTICAL STRANGERS was executive produced by RAW, Channel Four, and CNN Films. For CNN Films, THREE IDENTICAL STRANGERS was executive produced by Amy Entelis and Courtney Sexton. THREE IDENTICAL STRANGERS had its world premiere at the 2018 Sundance Film Festival where it won a special jury award. The film was distributed theatrically by NEON. 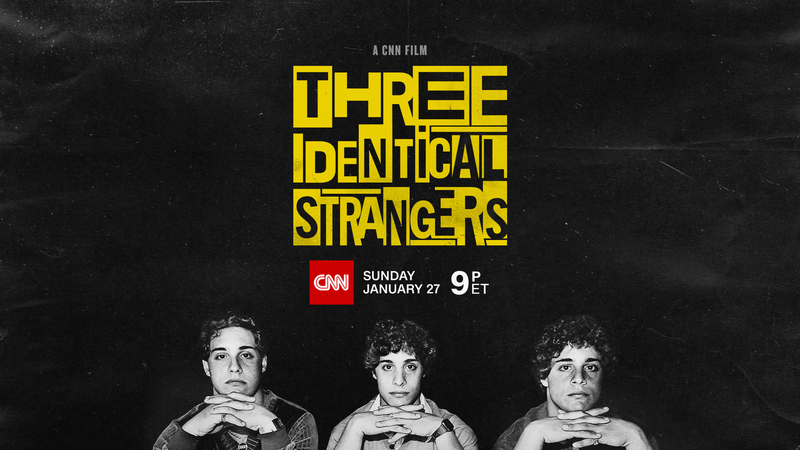 Additional information about THREE IDENTICAL STRANGERS may be found by visiting www.CNN.com/ThreeIdenticalStrangers. During the Jan. 27 premiere on CNN, THREE IDENTICAL STRANGERS will stream live for subscribers via CNNgo (CNN.com/go and via CNNgo apps for Apple TV, Roku, Amazon Fire, Chromecast, Samsung Smart TV, and Android TV) and on the CNN mobile apps for iOS and Android. The film will also be available beginning Monday, Jan. 28, on demand via cable/satellite systems, CNNgo platforms, and CNN mobile apps. THREE IDENTICAL STRANGERS will encore on CNN Saturday, Feb. 2 at 9:00pm and again, Sunday, Feb. 3 at 12:00am Eastern (Saturday, Feb. 2 at 6:00pm and 9:00pm Pacific). Social media users can connect with others commenting on the film during the broadcast by using the hashtag #ThreeIdenticalStrangers. CNN Films produces and acquires documentary feature and short films for theatrical and festival exhibition and distribution across CNN’s multiple platforms. Amy Entelis, executive vice president of talent and content development, oversees the strategy for CNN Films. Courtney Sexton, vice president for CNN Films, works day-to-day with filmmakers to oversee projects. For more information about CNN Films, please visit www.CNN.com/CNNFilms and follow @CNNFilms via Twitter. In addition to THREE IDENTICAL STRANGERS, directed by Tim Wardle, recent acclaimed CNN Films include: Love, Gilda, directed by Lisa D’Apolito; RBG, directed by Betsy West and Julie Cohen; and American Jail, directed by Roger Ross Williams.